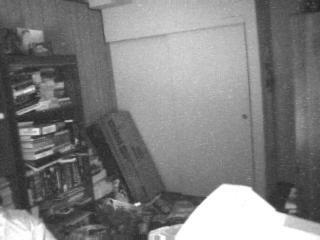 This is an image of my incredibly messy office, taken with the QuickCam in fairly low-light conditions. 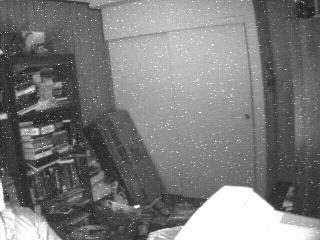 The QuickCam uses a CCD to gather an image. The elements of a CCD build up a charge when they're exposed to light; an image is derived from this by reading the charges of the picture elements. The problem is that during long exposures (as required in low light) there's "leakage current", and even pixels that are in relative dark will build up a charge. These are interpreted as bright areas when the CCD is scanned, and you get this speckling effect. On a color CCD, you get a "Christmas tree" effect, where the speckles are colored red, green or blue. This is another shot, with the despeckling filter applied. The filter doesn't just remove bright spots from an image; instead, I measure the performance of the camera in the dark, and see where the CCD flaws show up, and modify only those spots. In other words, if you take a picture of a starry night, this filter won't erase the stars (unless they happen to fall where the CCD is flawed anyway). 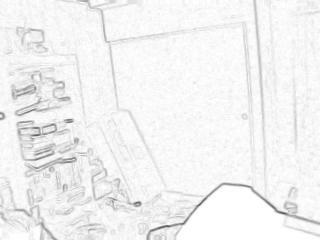 This is the same image with the edge detection filter applied. This isn't a particularly useful transformation, but it was easy to write.